If you’re looking for a traditional RAID enclosure, the Drobo Mini probably isn’t for you. If you’re looking for a fast multi-drive enclosure, the Drobo Mini really isn’t for you. The Drobo Mini is geared toward people who don’t know, and don’t want to know anything about RAID, who might have a handful of drives they’d like to put to use. With a Drobo Mini you don’t have to use identical drives, or even drives with the same capacity or speed. You can throw a 80GB drive and a 500GB drive in a Drobo and it’ll give you as much protected storage capacity as it can without you having to do anything. That said, the Drobo doesn’t always act as you might expect, and the extreme ease of use comes at the cost of performance. Installing drives in the Drobo Mini is as easy as pushing them in. Like a huge SD card. Before you can use your Drobo Mini you have to install the Drobo Dashboard software and put some drives in the Mini. Drobo Dashboard is easy to find and install; other than being a little slow to find our Drobo I didn’t have any major problems with it. The dashboard can warn you when you’re running low on space and can email you alerts, as well as format and restore your Drobo. The magnetic front panel is super easy to remove (almost too easy at times), it just sort of comes off. Behind the panel are four slots for 2.5-inch drives; all you have to do is push the drive in till you hear a click. It feels like you’re inserting gigantic SD cards. You can start with just two drives, but I put four in right away. 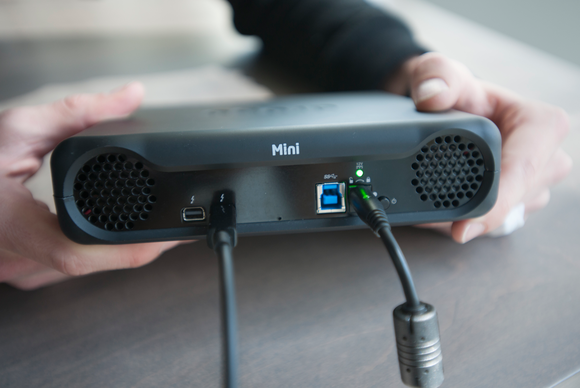 The Drobo Mini has a locking power cable. Just twist it where it connects to the Drobo to lock it down tight. Once your drives are installed and the front cover is back on, plug in the power cord. The power cord has a locking mechanism you can use by twisting the plug in the back of the Drobo—this way the power cord won’t slip out of your Drobo accidentally. 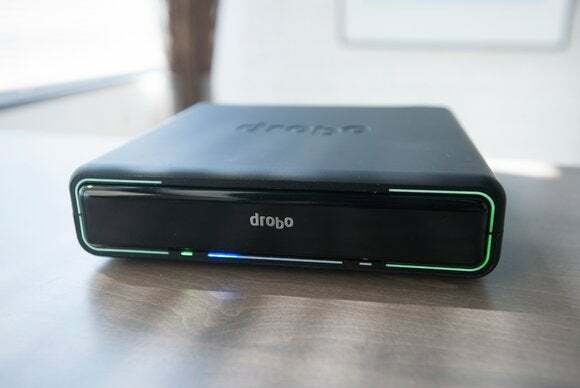 When you connect your drive to your Mac or PC with Thunderbolt or USB 3 and follow the prompts to format it, don’t be surprised that it shows up as a 17.5TB volume—Drobo is just making sure that when you add capacity, it won’t have to recreate the volume visible to the OS. The most compelling feature of Drobo Mini is its ability to take drives of varying capacities and render a large chunk of protected storage space back to the user. In a traditional RAID setup, your storage space is limited to the size of the smallest drive. Mixing drives of varying capacities limits the usable space on each to the size of the smallest, and you lose the extra capacity. So with three 1TB drives and one 500GB in a traditional RAID, you can only use 500GB on each drive. 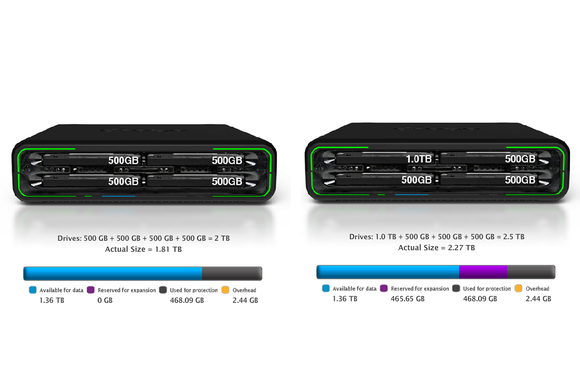 Drobo Mini with four drives: one is 5400-rpm mechanical, another SATA III SSD, and two more SATA II SSDs with varying capacities. Of course, there are still some limits to the usable space you get when mixing drive capacities in a Drobo. For example: I had four 480GB drives, and the resulting 1.33TB of usable protected space was running out. I rustled up another drive from somewhere in the lab and swapped one of the 480GB drives with a 960GB drive. Back at the Drobo Dashboard it was still telling me I was low on usable space, and instructed me to replace yet another drive. Oh yeah, and I didn’t get any more usable space. It’s not a glitch or an error—Drobo just can’t protect that space yet. Providing redundancy for your data is Drobo’s whole deal, so the Drobo Mini isn’t going to let you use space that can’t be protected by the other drives currently in the enclosure. Drobo puts that extra capacity aside until you swap another one of your drives for one with a higher capacity. This leads to some strange happenings: when all your drives have identical capacities, you actually have to swap two of them to get any increase in usable space. Drobo has capacity calculator online that helps you get a feeling of the storage space you’ll have available with different capacity drives. So be very, very sure to check the capacity calculator before considering a Drobo, and before buying any new drives that might go into your Drobo. Don’t expect blazing fast speeds from your Drobo Mini, even with SSDs. The way it manages your data behind the scenes makes it incredibly easy to use, but does end up cutting into performance. Writing to the drive, I saw speeds up to 242MB/s when dealing with large files, and up to 171MB/s when dealing with a collection of files and folders. Reading from the drive, I saw speeds up to 346MB/s when dealing with large files, and up to 236MB/s when dealing with a collection of files and folders. Remember, that’s with four 480GB SATA III SSDs. I also tested the drive with four 1TB 7200-rpm 2.5-inch drives, which gave me 2.67TB of usable space. Writing to the drive topped at 197MB/s with a single file, and 90MB/s writing a group of files and folders. Reading a single large file maxed at 316MB/s, but reading a group of files and folders was a lot slower, topping out at 66MB/s. To help put this in perspective, I took one of the drives out of the Drobo Mini, put it in a Seagate Thunderbolt Adapter, and ran the same tests on the drive by itself. Alone, the SanDisk X300s posted write speeds of 343MB/s and read speeds of 384MB/s in our in-house tests. This isn’t comparing apples to apples, since there’s no data protection on the single drive. Looking at those numbers it almost seems ridiculous to use SSDs in a Drobo Mini. You’re simply spending more money than you get back in terms of speed. 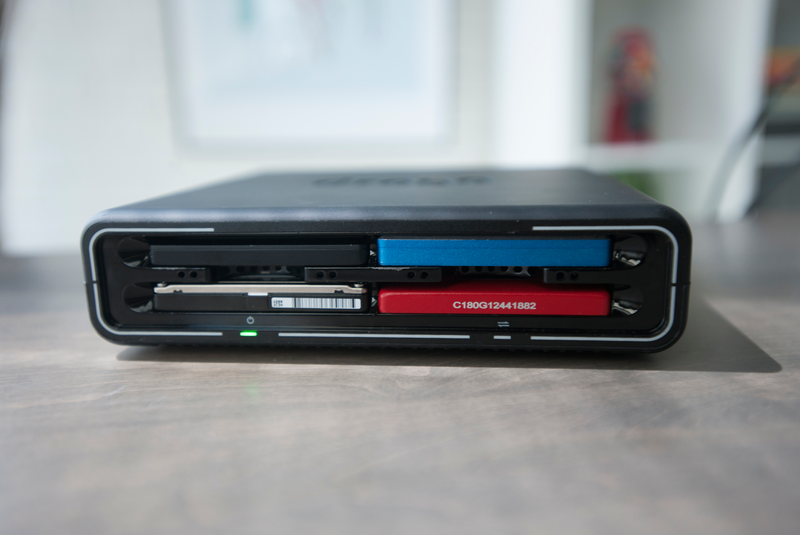 If you’re looking to invest in a Drobo Mini, stick with rotational drives unless money isn’t a factor to you—or you just happen to have a bunch of 2.5-inch SSDs lying around usused for some reason. 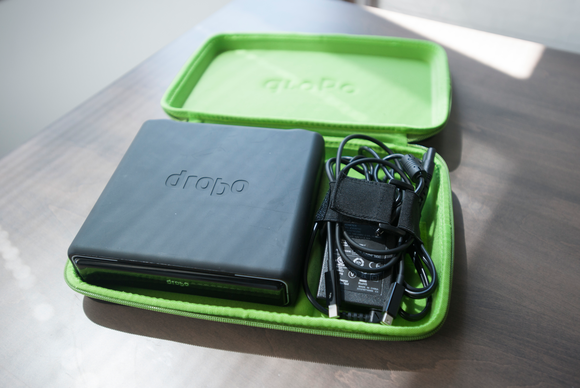 The Drobo Mini comes with a carrying case, so even though it might be a bit heavy you can carry it around safely and neatly. The Drobo Mini is marketed as portable, and even comes with a carrying case that fits the drive, power supply, and cables. However you still have to tote around the bulky case—it weighed 4.24 pounds with SSDs and 4.69 pounds with HDDs) and find an outlet before you can use the Drobo Mini in the field. The Drobo Mini isn’t meant to compete directly with traditional RAID options. The drive is intended for people who need protected storage rather than fast speeds, and don’t want to learn about RAID. If you’re using some old drives you have lying around to create some protected storage for a technophobic relative, it can be a compelling choice. If you want something customizable or with blazing fast speeds, you might want to read an article on RAID. The Drobo Mini can be a compelling storage device for somebody looking for protected storage and nothing else. You can use drives you already have and you don't have to worry about matching drive capacities or spindle speeds. However ease of use comes at the cost of performance.